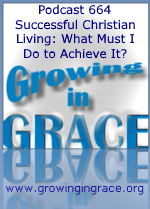 Growing in Grace Podcast: 664. Successful Christian Living: What Must I Do to Achieve it? Churches are known for pushing an agenda containing a variety of principles and moral standards for the members to work at trying to live up to in order to attain a higher level of dedication and perhaps even a greater degree of blessing and acceptance from God. It sounds right and it will preach good on Sundays. 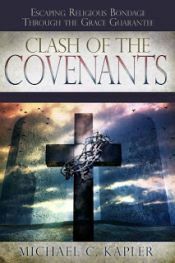 But this has led many parishioners or former church-goers to a place of frustration and guilt… even unworthiness, as they struggle to live up to the standard they have been taught by others who haven’t been able to live up to the standard they teach themselves. A question should be asked… what specifically do we need to do in order to achieve the status of successfully “living the Christian life?” Rest assured, the list provided by religion will change and evolve, and usually without the specifics. Our program this week encourages believers in Christ to stop chasing the imaginary carrot that religion will dangle in front of them but will never bring the satisfaction they are seeking.